Short form scholarship on born digital poetry and poetics. These two video poems integrate four elements: Natalia Fedorova’s voice reading silky lines of her sonorous poetry in Russian, a Mac Os text to speech voice reading a translation in English, Taras Mashatalir’s haunting musical soundscapes, and Stan Mashov’s conceptual videos. 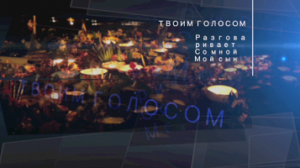 The contrast between Fedorova’s voice, even though it’s been transformed through sound engineering, and the mechanical reading provided by the software emphasizes how much meaning inheres in breath, tone, and intimacy when performed “in your voice.” The video is composed of fragmented flowing surfaces which contain images that enhance the experience of the poem, while the music helps shape the tone and pulls the work together by situating the voices within the space evoked by the visuals. If you really want to lose yourself in these two poems, I suggest viewing it in Vimeo on fullscreen mode with good sound or headphones.